Without knowing anything about the game or how it worked, I dove right into my first run in survival mode on "voyager" difficulty. 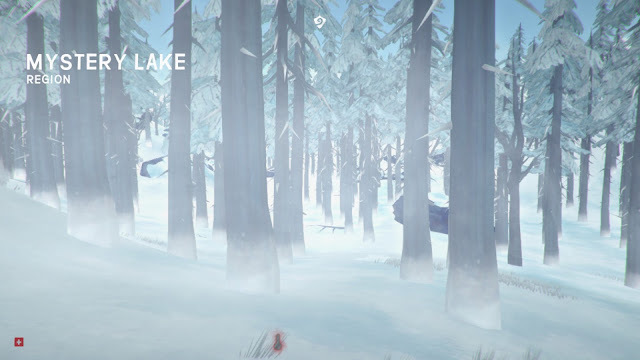 I wake up in the middle of a snowy forest in Mystery Lake. It's so pretty! I frolic among the trees, chase some rabbits, and admire the painterly textures. Then the game tells me: "Your body temperature was too low for too long. You will weaken until you stay above freezing for 24 hours." Oops. I hadn't even been paying attention to the temperature gauge at the bottom of the screen. When I check my character inventory screen, it turns out I didn't start with any shoes. This whole time, I've been walking in the snow in my bare feet. I had no idea I was exposing myself to hypothermia. I wander for several in-game hours and still can't find any shelter. I try hiding in an old ruined hunter's hut near an "unnamed pond", but there are huge holes in the walls and cold air is still blowing in, offering scant protection from the incoming blizzard. I collect some nearby sticks and old newspapers, and finally figure out which menu options would let me try to start a campfire, but then the game forbids me from setting the fire on a wooden floor. I can't stay here. Off in the distance, I saw a large firewatch tower. Maybe I could run across this frozen pond, and find a nice warm bed at the top? I could just scale that cliff, and jump over the rocks like a mountain goat, like in Skyrim and countless other first person games. As I approach the cliff face, I tap [SPACE]... and instead of propelling my character effortlessly into the air, it opens a menu. Turns out, this game doesn't have jumping, and instead I fall off the rock and sprain my ankle. 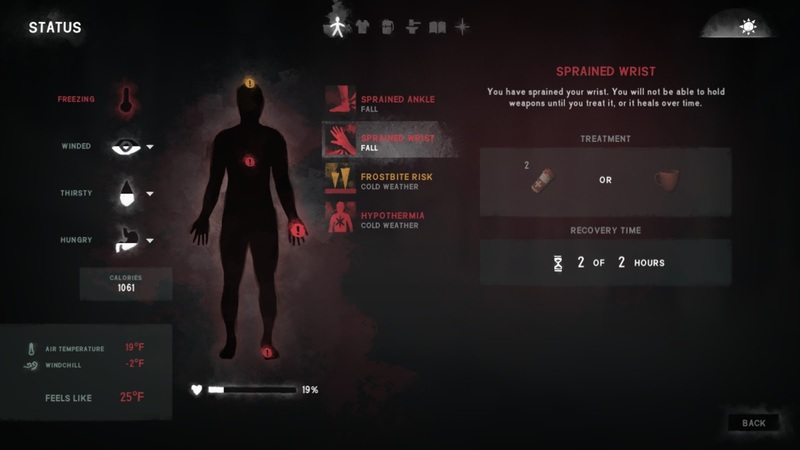 The game also takes the opportunity to tell me: "You have sustained frostbite. Your general condition is permanently reduced." Condition is what the game calls health. I have about 19% of it left, and it's falling rapidly. I try backtracking to find a cave, to find anything. 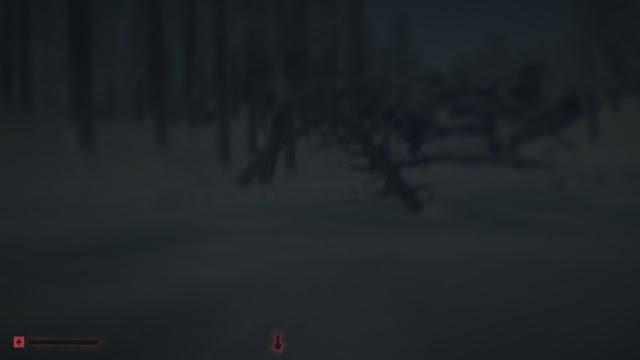 Surely this game wouldn't just let me freeze to death in the starting area! In a purely physical sense, a video game cannot make you cold. If anything, video games actually make you warmer, by directing your computer to work harder and therefore produce more heat. 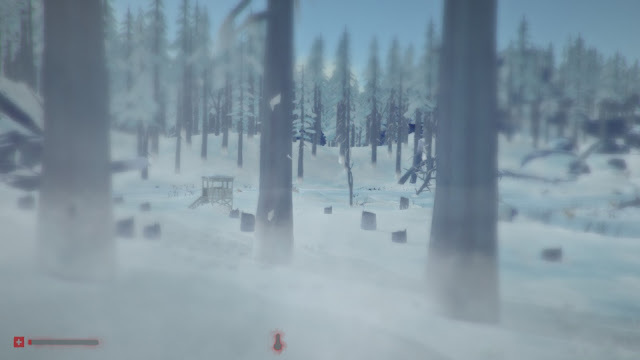 But learning how to survive in The Long Dark involves learning how to feel cold through the screen, how to sensitize yourself to all these various game cues for coldness. In this sense, immersion is not a bygone effect, but rather, immersion is a skill that you must cultivate. You can check your character screen for an accurate air temperature reading (with windchill factored in too!) but those numbers quickly become redundant. A real survivalist can look for wind particles, and analyze the color of the snow and sky. How many breath particles are coming out of your in-game mouth? (Tip: where a scarf to cover your mouth.) 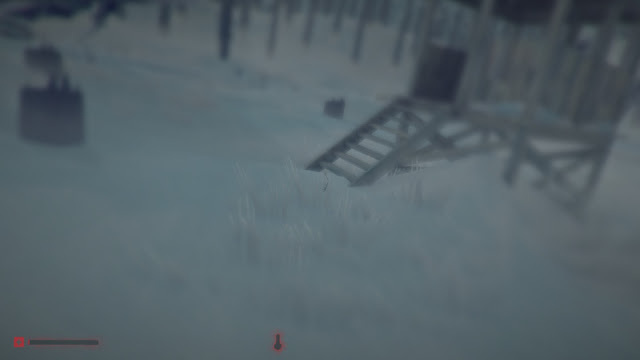 Can you stay outside for an hour to harvest the meat from this deer carcass, or will you freeze to death? In the same way that Mario games demand that you develop a "feel" for the numbers embedded in gravity, velocity, and acceleration, The Long Dark helps you develop an intuition for how long you should spend outside and when you should turn back. Sometimes you'll be able to feel a blizzard coming soon. To survive, you must learn how to feel cold and how to develop these instincts, or at least some sort of game-y simulation of instinct. Unfortunately, I haven't developed those instincts yet. My screen darkens and my view wobbles for the last time. My walk slows to abrupt spurting lurches until finally I collapse on the snowy ice. "You faded into the long dark." What I'm saying is that I like cookies, but I also like freezing to death in the first 5 minutes of the game.